This post is overdue, but I really feel the need to blog about it. Because it's so cute & funny. Last Sunday, the Bubbs had her first opportunity to give the scripture and prayer in Primary (children's Sunday School). I was soo excited ALL week, because I just knew that she would be the cutest darn kid in the whole world and would be perfect in every way. We practiced. We put in a bandaid bookmark in her own set of scriptures. We pretended we were talking into a microphone. Anticipation mounted (for me, not for her... she couldn't have cared less really). This was not how I'd imagined it, people. She was waiting for me to come help her, and she was digging away. A little mortified, I went up to her and said in my sweetest you're-lucky-people-are-watching-because-otherwise-I-would-not-be-this-nice voice, "Okay, honey, take your finger out." "BUT I'M NOT DONE YET!" said loudly into the microphone. "Do you want me to do the scripture?" "3rd Nephi, chapter 18, verse 21. Pray in your families unto the Father, always in my name, that your wives and your children may be blessed." How dang cute. Wish I could have seen that. nose picking and all. Laughing . . .I love little kids. They are so honest and so in the moment. And they have their own priorities. Sounds like something my kids would do. Oh my, too funny! 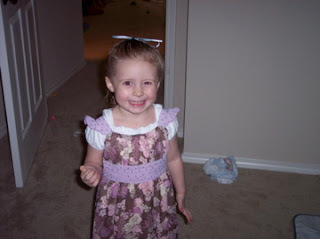 And my princess has that Target dress, too!